Brazilian website E-Farcasa is taking submissions for the first-ever Foolitzer Prizes, an award meant to report—er, honor—the insidious termites of our collective cathedral of knowledge. E-Farcasa, which translates to "e-farces," is Brazil's version of fact-checking site Snopes.com. Leo Burnett Tailor Made São Paulo helped give life to the Foolitzer, which uses recognition to call out fake news producers. "We all have the responsibility to combat misinformation … all of us, as interlocutors, must seek the origin of the content we consume," explains Leo Burnett Tailor Made's creative VP, Wilson Mateos. "We need to create a culture of questioning," hence the "anti-prize" for "anti-journalism." "After all, what the creators of fake news least want is to be recognized on account of their lies," he points out. This isn't just a snide anti-award; it's a public service, E-Farcasa argues. Categories include politics, health, conspiracy, sports, entertainment, and a popular vote for the Grand Foolitzer, or the worst fake news of 2018. A few of our favorite nominees include Ban Lethal Autonomous Weapons (under conspiracy), which seeded the story, "Killer drone has artificial intelligence and real ammo." In politics, Et Urbs Magna is called out for claiming Bolsonaro would confiscate Brazilian savings. Over in entertainment, Taco144 on Reddit is recognized for being the (perhaps unwitting) originator of the belief that the Avengers: Infinity War poster rips off a Dragon Ball promo. "We do the job of checking information and debunking a rumor before it actually becomes 'fake news,' but over the last couple of years we've noticed an increase in both output and consumption of fake news, which has greatly influenced the behavior of Brazilians," says E-Farcasa's founder, Gilmar Lopes. "Bringing together the worst is a way to show the public which news outlets fabricate fake news, either with malicious intent or simply for more hits." Winners will be announced in early February. All will be chosen by E-Farcasa's team, with the exception of the Grand Foolitzer. Voting opened on Jan. 15 and is now live on the website. 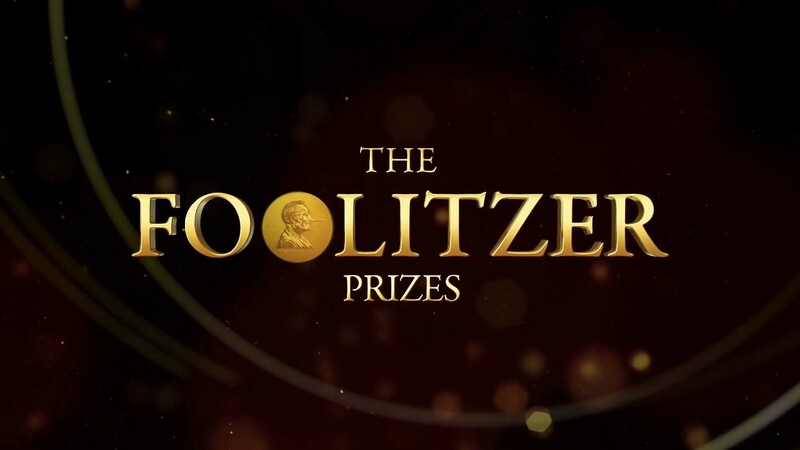 Winners will actually receive an award once results are shared—a coin, inspired by the original Pulitzer Prize. The medal features E-Farcasa's logo—a man who, apart from his growing nose, looks remarkably similar to a mischievous Abe Lincoln— and the inscription "Worst Fake News of the Year 2018." The campaign includes an online push, posters, promotional films and an award ceremony. Check out a poster below, both on its own and in context. Created By: Breno Balbino, Fabio Nagano, Filipe Medici, Renato Ramalho.